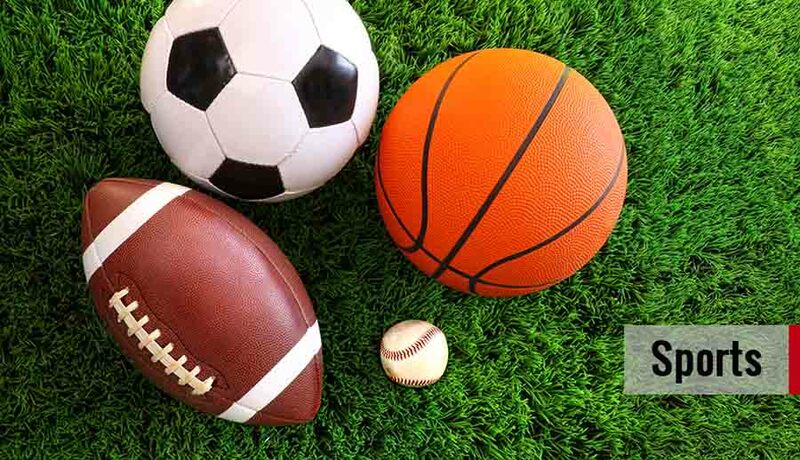 Browse by sports from AFL, Basketball, Cricket to Football, Rugby Union and more. Find the sports team of your choice and select from a wide range of sports merchandise. You may also use the search bar to find the specific product you are looking for. 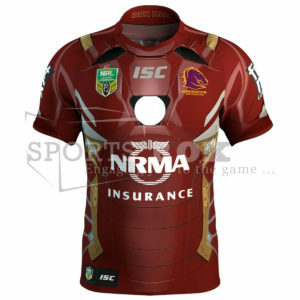 Bring out your Iron Man game as the Brisbane Broncos join forces with Marvel Heroes Round 4 of the 2017 NRL Competition. These are designed with performance fabric for durability and comfort. The jersey features a comfortable neckline, slim fit, and 100% polyester fabric. Bring out your inner Super Hero. 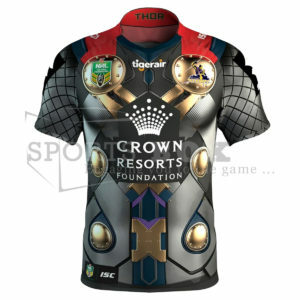 The Canberra Raiders team up with Iron Fist, Marvel Heroes Round 4 of the 2017 NRL Competition. These are designed with performance fabric for durability and comfort. The jersey features a comfortable neckline, slim fit, and 100% polyester fabric. Bring out your inner Super Hero. The Manly Warringah Sea Eagles team up with Falcon, Marvel Heroes Round 4 of the 2017 NRL Competition. These are designed with performance fabric for durability and comfort. The jersey features a comfortable neckline, slim fit, and 100% polyester fabric. Bring the thunder as Thor. The Melbourne Storm join forces with Marvel Heroes Round 4 of the 2017 NRL Competition. These are designed with performance fabric for durability and comfort. The jersey features a comfortable neckline, slim fit, and 100% polyester fabric. Bring out your inner Super Hero. The Newcastle Knights team up with Iron Patriot, Marvel Heroes Round 4 of the 2017 NRL Competition. These are designed with performance fabric for durability and comfort. The jersey features a comfortable neckline, slim fit, and 100% polyester fabric. Bring out your inner Super hero. 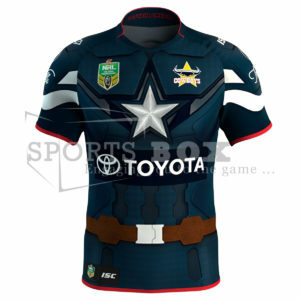 The North Queensland Cowboys join forces with Captain America, Marvel Heroes Round 4 of the 2017 NRL Competition. These are designed with performance fabric for durability and comfort. The jersey features a comfortable neckline, slim fit, and 100% polyester fabric. 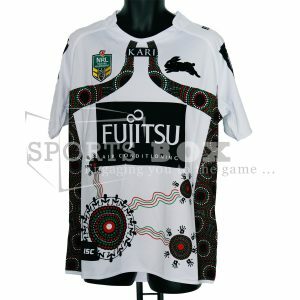 South Sydney Rabbitohs Indigenous Jersey 2015 Available in Men’s and Kids sizes, the 2015 Indigenous Jersey designed by Nikita Ridgeway – Designer, Founder and CEO at Dreamtime Ink Australia – the jersey uses symbols to reflect various elements of indigenous communities and culture, including their connection to the South Sydney Rabbitohs Aboriginal players, past, present and future. 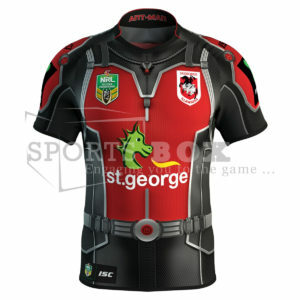 Jersey Elements: Spirits: represent past, present and future Aboriginal Rabbitohs players. These are placed around the gathering symbols. Community Gathering Symbols: large symbol with Spirits, represents the Club itself. Smaller gathering symbols with hands surrounding them represent the communities the Club has inspired and that have been influenced by the South Sydney Rabbitohs. Hand Prints: represent the many helping hands in the community Travelling Tracks (Green and Red Lines): represents the journeys and paths of those players who worked hard to be able to play for the Rabbitohs and their journeys back to their communities to give back Dreaming Tracks (above chest and around heart): these two designs represent the flow of the journey and Dreaming Story of the South Sydney Rabbitohs’ connection and guiding role with Aboriginal Players from past, present and future. 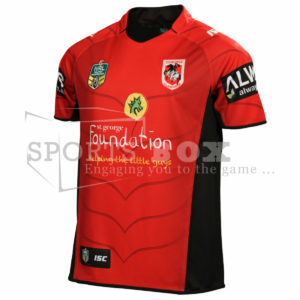 Show your support with this St. George Illawarra Dragons jersey. This is the perfect addition to any supporters wardrobe. These are designed with performance fabric for durability and comfort. 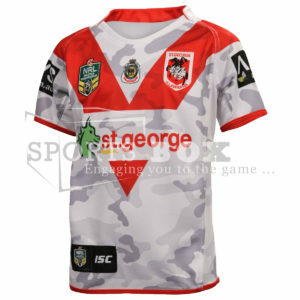 Show off your proud team colours in your St. George Illawarra Home jersey. This is the perfect addition to any supporters wardrobe. These are designed with performance fabric for durability and comfort. Bring out your inner Super Hero. The St George Dragons join forces with Ant-Man, Marvel Heroes Round 4 of the 2017 NRL Competition. These are designed with performance fabric for durability and comfort. The jersey features a comfortable neckline, slim fit, and 100% polyester fabric. 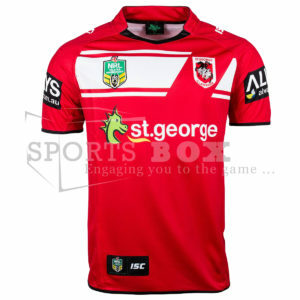 Show off your proud team colours in your St. George Illawarra Dragons jersey. This is the perfect addition to any supporters wardrobe. These are designed with performance fabric for durability and comfort. 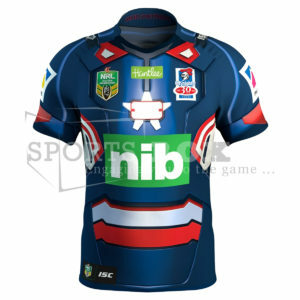 This special commemorative Sydney City Roosters Premiers Jersey 2013 jersey would make the perfect gift for any fan or collector and is a must have if you want to show off your support and love for your Mighty Roosters! These are designed with performance fabric for durability and comfort. Bring out your inner Super Hero. 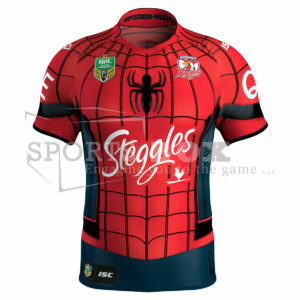 The Sydney Roosters team up with Spider-Man, Marvel Heroes Round 4 of the 2017 NRL Competition. These are designed with performance fabric for durability and comfort. The jersey features a comfortable neckline, slim fit, and 100% polyester fabric. 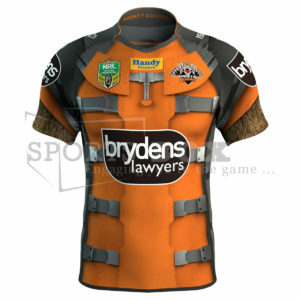 Bring out your inner Super Hero.The Wests Tigers team up with Rocket Raccoon from Guardians of the Galaxy, Marvel Heroes Round 4 of the 2017 NRL Competition. These are designed with performance fabric for durability and comfort. The jersey features a comfortable neckline, slim fit, and 100% polyester fabric.